Hi all, hope you all had a good Christmas and New Year. 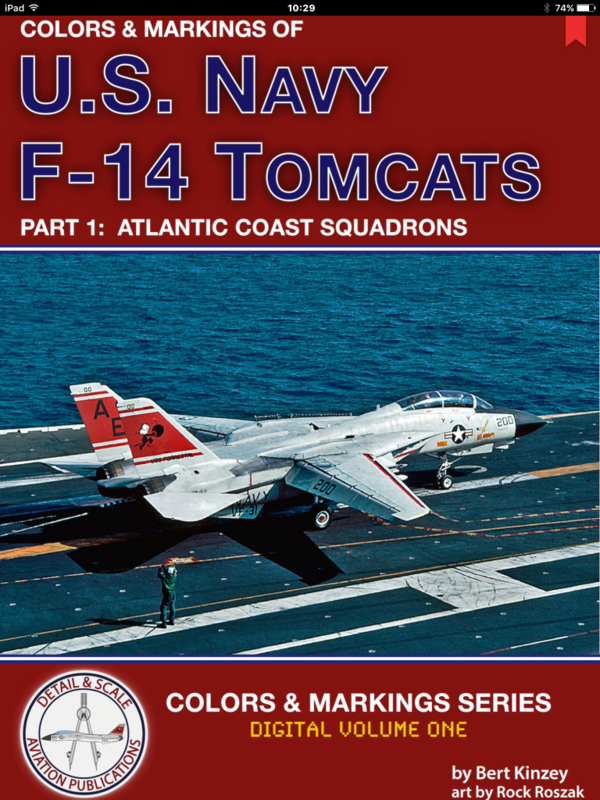 Just before christmas I was lucky enough to win a copy of the new digital book ” U.S.Navy F-14 Tomcats Part1: Atlantic Coast Squadrons. By Bert Kinzey and Art by Rock Roszak. Now being the age I am I’m more used to picking up a book faithfully printed on that good old thing called paper and merrily skipping through the pages to find the information I need so this new venture into the digital age was a real eye opener. As I skipped through the pages I was truly amazed by how easy it was to find the information I needed and when that information was a picture being able to blow the picture up to the size these poor old eye’s needed to see certain details and still have a superb quality image there in front of me I was converted to digital. This new media is so easy to use and no I don’t have a hard copy on my bookshelf but all I have to do is go to my mobile phone, tablet or computer and hey presto everything I want is there at my fingertips whether I’m in the house or out somewhere there it is a book just to read or get that all important information I might need. Finally to the book itself, well it’s got to be a huge thanks to Bert and Rock for producing such a superb publication everything I needed to know about the Atlantic Navy F-14 was there at my fingertips I will be most definitely be purchasing the rest of this series in digital format. Thanks from a digital convert, regards Steve. 1 response to U.S.Navy F-14 Tomcats part1 Digital publication. Thanks for posting this, Steve…all good info (and I miss the ol’ Tomcat).